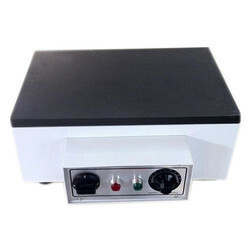 Providing you the best range of laboratory rectangular hot plate with effective & timely delivery. Through the wide and rich industrial experience, we are able to offer Laboratory Rectangular Hot Plate. We use new technologies and machineries for the process of manufacturing our products. These are reliable and are cost-worthy to satisfy the customers needs. In resorts, dhabas, restaurants and canteens these are widely applicable for proving sound free and pollution free way of cooking. These industrial hot plates are widely used in various industries such as automobile, chemical, pharmaceuticals and others. Available in various specifications, these industrial hot plates are offered at competitive prices for our client.We are one of the well-established manufacturer, supplier and exporter of Round Hot Plates. These hot plates are manufactured using high grade raw material and consists of cast iron table top, frame made of P.C.R.C. sheet coated powder paint and energy controller to regulate the temperature from ambient up to 350 degree C. Moreover, the table top of the unit consists of heating elements of 1.5 kW rating and is round in shape with diameter of 20 cm. Looking for Laboratory Rectangular Hot Plate ?